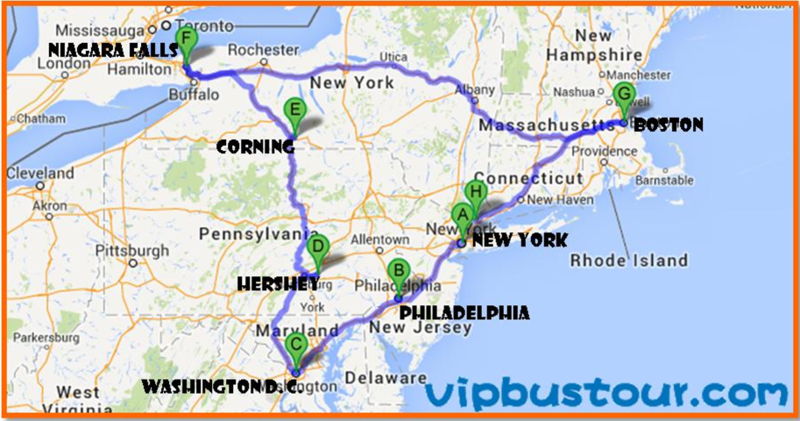 Driving northeast along the scenic roads on the east coast and across the New York State, Connecticut State, and Rhode Island, we enter Massachusetts State. 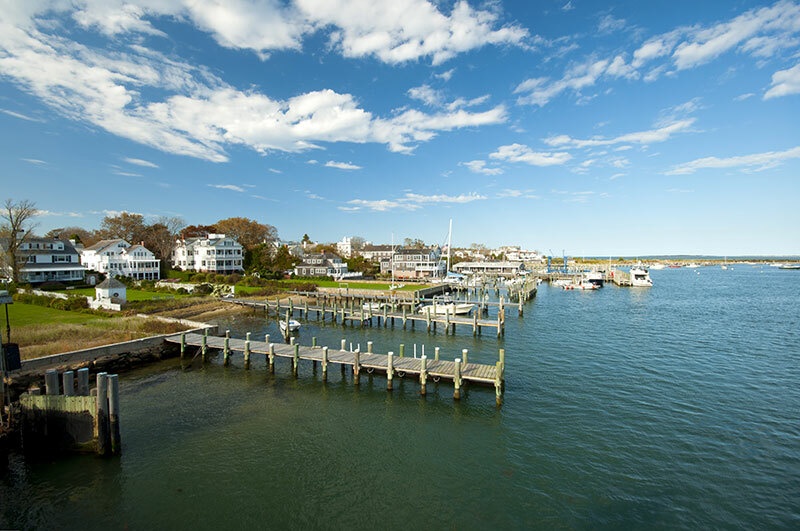 By taking a 45-minute ferry, we reach Martha's Vineyard, an ideal getaway for relaxing! Each of the Island's six towns provides access to spectacular beaches and outdoor activities while at the same time offering an enjoyable selection of shops, restaurants, and other attractions. 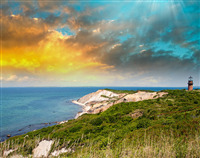 We will visit Aquinnah Cliffs – formerly known as Gay Head. Rising 150 feet above the ocean, these spectacular clay cliffs have the most breathtaking view on the entire island. From this visit, you can see the Elizabeth Islands, Norman Island, Cape Cod, and a sweeping view of Vineyard Sound. It has been a secret haven of the rich and famous for decades. Thanks to frequent visitors like President Barack Obama who spends summer vacation here every year, the "Hollywood East" reputation is going strong with growing numerous tourists. 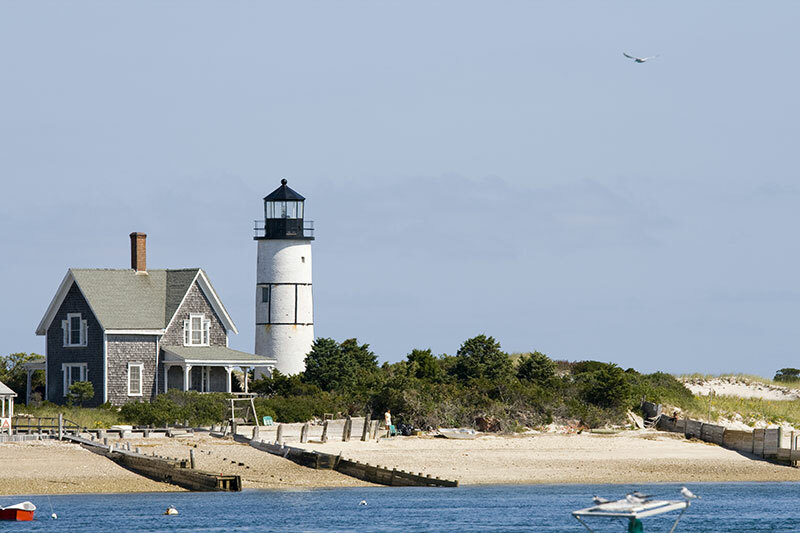 Following we will visit Edgartown - the Island's first colonial settlement, and it has been the county seat since 1642. The stately white Greek revival houses built by the whaling captains have been carefully maintained. They make the town a museum-piece community, a seaport village preserved from the early 19th century. Whale Watches - Imagine being within feet of some of the most graceful, rare mammals in the world. 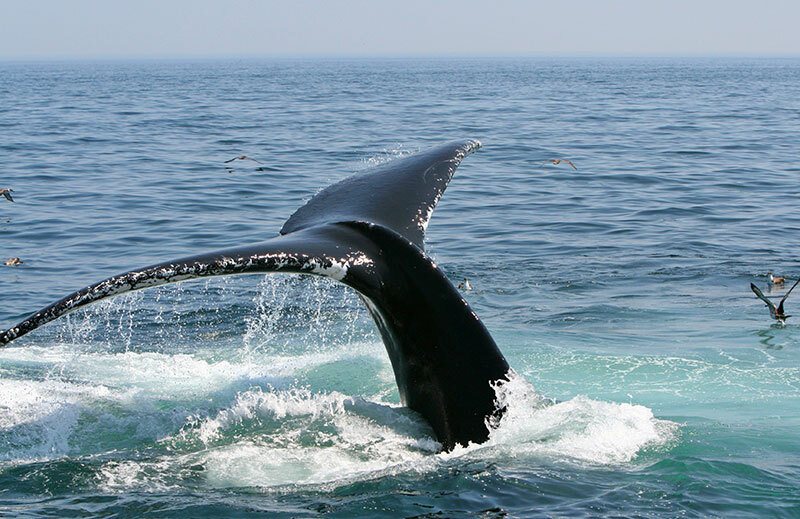 Departing from Plymouth Harbor, our whale excursion gives you the chance and the opportunity to experience sights that you will never forget. Stellwagen Bank is a marine sanctuary and one of the primary feeding grounds for Humpback Whales, Dolphins, Fin Whales, Minke Whales, and Harbor Porpoises. Our experienced naturalists will guide you on a trip that is educational, exciting and impressive; you will learn how individual humpback and finback whales can be identified using unique markings and pigmentation patterns that are found on their bodies. Provincetown - Provincetown is at very tip of Cape Cod. It has long been known as an art colony, attracting writers and artists. The Cape Cod National Seashore is a popular beach destination with easy access to coastline and 40 miles (64 km) of sandy beaches, both public and private. The Cape has upwards of sixty public beaches. 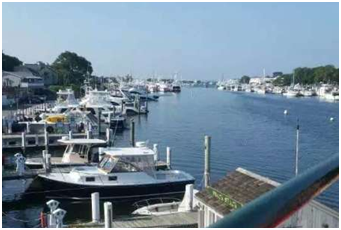 You will have chance to enjoy fresh Lobster, Tuna, and shellfish at local seafood restaurants and bars. Whydah Pirate Museum - Commanded by the famed pirate Sam Bellamy, the Whydah was wrecked off Wellfleet in 1717, taking with her the treasures of fifty plundered ships. Bellamy’s loss was history’s gain, however, as the contents of his once-proud flagship represent a unique look into the lives of the pirates, and an unprecedented cross-cultural sampling of treasures from the world of the 18th century. Here you can touch and see 300 year old silver pirate coins, Akan gold jewelry, cannon, cannon ball, rare navigation instruments, pirate pistols, sword hilts, ships rigging and much more! The Pilgrim Tower (Monument) - The Pilgrim Monument was founded in 1892 as the Cape Cod Pilgrim Memorial Association, Cape Cod’s oldest not-for-profit organization. 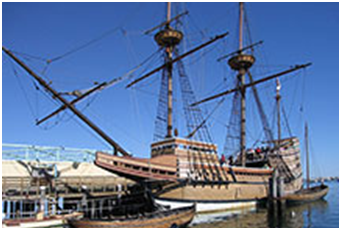 Its purpose is to commemorate the Mayflower Pilgrims’ first landing in the New World in Provincetown, in November 1620. Here the Pilgrims spent 5 weeks exploring the tip of Cape Cod, before they sailed on to Plymouth. They also drew up and signed the Mayflower Compact, which established the rule of law for the new land. The Cape Cod Pilgrim Memorial Association built the Pilgrim Monument to honor the Pilgrims’ first landing in Provincetown. President Theodore Roosevelt laid the cornerstone in 1907. In 1910, President William Howard Taft dedicated the finished 252-foot tower. In 1910, the Cape’s first building built to house a museum opened at the base of the monument, to educate the public about Provincetown’s role in Pilgrim history and American history. Plymouth Plantation - We will Visit the English Village, which is a recreation of the small farming town built by English colonists. The people you will meet here talk of the past, Step into a traditional house Surrounded by soft furs, flickering firelight, and artfully woven bulrush mats, learn about traditional Wampanoag family life as well as the arrival of the English from an Indigenous point of view. Walk around outside and enjoy the scent of stew as it simmers over an aromatic wood fire. Take this unique opportunity to explore the perspectives of the Indigenous Wampanoag who have lived on this land for hundreds of generations. Mayflower - You may be surprised at what you learn! 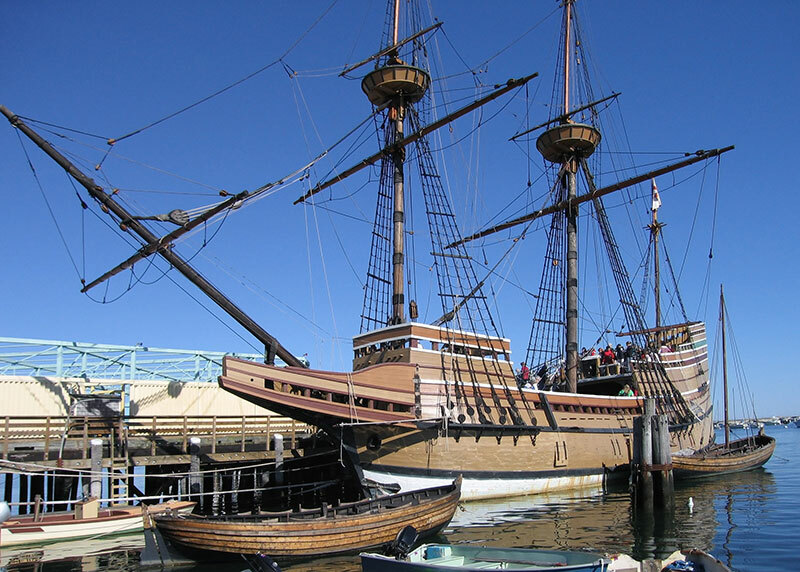 Come aboard Mayflower ship and learn about the 1620 voyage, Explore the cramped quarters of the ship's passengers. Peer down into the lower level, where the food, clothing, furniture, tools and other items necessary to start a colony were stored. You will meet staff in modern-day clothing who speak from a present-day perspective. They can talk with you about the original Mayflower as well as the reproduction vessel Mayflower.